Happy one year, with fried rice. A year ago today, my husband and I were married in Michigan. We danced in a big white tent that was set up in the backyard, on a hill, with a long staircase that led to a lake, where we said our vows before our family and friends. All week, I've been looking back at this past year, trying to wrap it all up in newlywed memories. But Murdo and I lived together for two years before we were married, so with the exception of a name change and wedding bands, our first year wasn't that much different than the ones before. And then I think about the future, and how different this first year will be from every year that follows. We'll look back and remember buying furniture for our tiny apartment, and the private rooftop terrace of our honeymoon suite. We survived a long, blizzard-y winter with cozy fires and breakfast for dinners. We adjusted to new work schedules, celebrated promotions, kept our fingers crossed and held our breaths. We said goodbye to a family member, and welcomed two more into our home. He taught me how to change a tire. I taught him how to cook white rice. The food of our first year of marriage has been, for the most part, fairly routine. I've tried a new recipe here and there, but only a handful have made it to the weekly rotation. We have our regulars, our trusted dishes, the ones that we eat over and over again, because they're quick and they're simple and we know what we like. When I was thinking of a recipe for our one year anniversary post, I couldn't think of anything new or exciting or special. All I could think about was fried rice. We eat fried rice once a week here, nearly every week, always accompanied by a bag Trader Joe's frozen Mandarin orange chicken. It's nothing special, I know -- even borderline boring -- and that's the reason why I've been hesitant to even post a recipe for it. But it was the first dish I ever learned how to cook on my own, and it's the one that we can eat every week and never get sick of. Murdo makes the white rice before I get home, and once I walk through the door and get settled and start cooking, I can have a meal on the table in 20 minutes. Twenty minutes! That is my kind of meal, and it's one that I know will follow us to our next home, and our first house, and one that we'll feed to our kids. It'll survive many more anniversaries to come, and every time I cook it, I hope I"ll remember this first year. Happy one year anniversary, Murdo. I can't wait for more. After you read this recipe, you might notice that it breaks all the rules when it comes to what other recipes might say about "real" fried rice. For example, you're supposed to use leftover cooked rice instead of hot, just-cooked rice, otherwise you'll end up with soggy results. But I never have leftover white rice, and I'm not going to cook rice a day ahead of time for a dish that's supposed to take just 20 minutes to put together. This is supposed to be quick and easy, after all -- a meal you can put together when you realize there is nothing else in the house to eat. So, I use fresh rice, and I don't think it gets soggy at all. I also use frozen vegetables, and I don't ever measure. I tried this time around, but completely forgot halfway through, so the soy sauce measurement is more of a guess. Like I mentioned before, this is the first dish I ever cooked on my own, and I didn't have a recipe then, either. The only thing I screwed up was the garlic, which I burned. By the second time I made fried rice, I was a pro. You will be, too. Cook rice according to package directions, or however you normally cook your rice. I rinse mine a few times and cook 1 cup of rice with 1 1/2 cups of water in a rice cooker. It usually takes about 20 minutes. Heat oil over medium-high heat in a large, deep skillet. Add garlic and cook until sizzling and fragrant. (If you are cooking with meat, add now and cook until heated through or, if using shrimp, fully cooked, then remove and set aside.) Add veggies and cook a few minutes until just soft. Sprinkle with black pepper. (Here is where I would add a drizzle of toasted sesame oil, or oyster sauce, or fish sauce.) Add a few dashes of soy sauce, about 1/8 cup, and cook a few minutes more. Serve with Trader Joe's orange chicken, or topped with a fried egg, for a perfect weeknight meal. The cutest. 1. I love knowing you. 2. I love these wedding photos. 3. 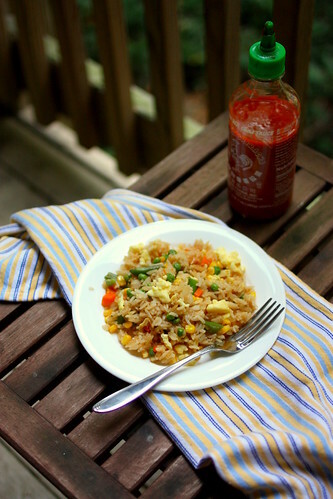 I love how you can write a post about making fried rice and make it not only inspiring but also so sweet and thoughtful, filled with thoughts about marriage and memories and life. You are one of my favorite people to read. You guys are gorgeous! Love love the photos!! 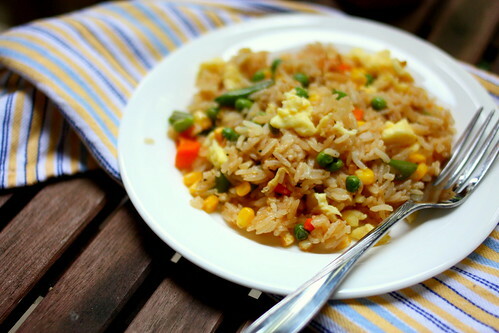 Ah yes fried rice...a staple here too :) And a great place to make leftover new. And YES to the sriracha! This is so sweet. Happy anniversary! I made kimchi fried rice once and we loved it. I might have to add your recipe into the rotation, too. I love fried rice, thank you for the recipe! This sounds strange but you are one of the only blogs that I sit and read through each post. You're dang talented lady! Happy belated anniversary! I'm pretty sure there's no better way to mark the day than by talking about a dish you've shared together this past year. Here's to many more years of fried rice together! This post makes me happy. Hooray for love! congrats, congrats! Shanna - Thank you, thank you and thank you! Miss you dearly. ChichaJo - Sriracha is my new favorite condiment! I'm so happy to finally being able to tolerate heat -- it's like a whole new world of spicy foods out there! Nicole - Mmmm I love kimchi! Hannah - Aw thank you so much! You are so sweet. Maddie - Oh yes, there's many more years of fried rice to come. :) Thank you! Megan - Hooray for love, indeed. Thanks, girl! And a delicious, simple recipe, they're the best ones. Thanks, Emma! And yes -- simple recipes are the best! Endless recipe for the fried rice. Great post here. Just made this for lunch and switched it up quite a bit but it is a great starter recipe. Thanks!